Produced by the Center for Sustainability. Happy New Year! We wish you a Green 2017 from the Center for Sustainability! Nationally, we were recognized as a top green university by Princeton Review for the 6th year in a row. We improved our recycling efforts during RecycleMania by 9,300 lbs. and placed 1st in the state in bottle and can recycling. We hosted our 4th Annual GreenFest in Statesboro with a record turnout of >1,500 people and 40 vendors. President Hebert and Darron Burnette, CEO of Sea Island Bank, provided remarks. Our 2nd Annual Pallet Challenge brought in 26 registered teams from three counties with unique and creative entries. On campus, CfS purchased 3,000 seven-gallon recycling bins and partnered with Housing to place them in every residence in all 8 residence halls. Now every student has easy access to recycling in his/her GS home and can earn prizes from CfS for every 10 bins of recycling. CfS granted nearly $250,00 towards sustainability advances on campus for FY2017 - bottle fillers, bike repair stations, continued restoration of Beautiful Eagle Creek and much more. 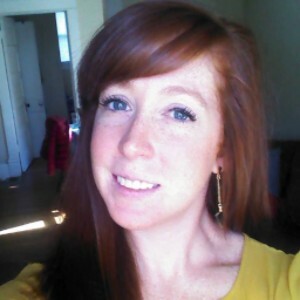 CfS hired a full time program coordinator, Cami Sockow, who comes to us from Southern Illinois University-Carbondale. Enjoy our upcoming spring semester events and programs available to the campus and community free of charge, and remember to be True Blue and Green Too! These events and programs are available to the campus and community free of charge and we hope you will join us! For a complete list of all the Center for Sustainability Spring 2017 events, visit the CfS website here. In October 2016, the Center for Sustainability welcomed staff member Cami Sockow as the new program coordinator. 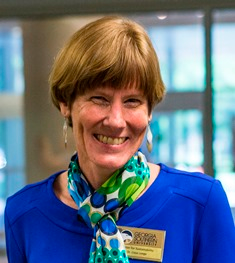 Ms. Sockow moved to Georgia from Southern Illinois where she received her MS in Geography and Environmental Resources with a concentration in Sustainability. As a member of CfS, Cami is in charge of all graduate and undergraduate student employees, oversees all of the programs and events put on and hosted by CfS, and represents the center along with the director, Dr. Leege. 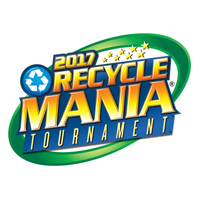 RecycleMania, a collegiate recycling competition, will take place from February 5 - April 1, 2017. Recycle everything you can to help us become a top recycling university in the nation! Remember, ALUMINUM CAN RECYCLING IS BACK on campus - use the green bins. 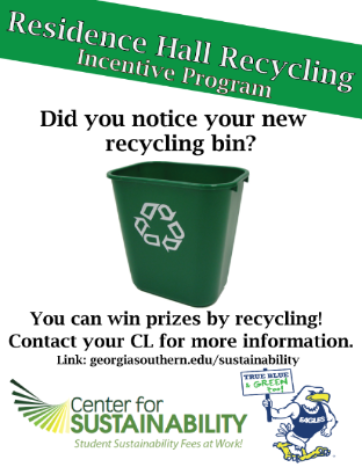 Visit the Center for Sustainability for more information about RecycleMania. Caught Green Handed - We are partnering with Facilities to catch people green-handed during RecycleMania. Facilities and CfS staff will stop people that are caught taking a sustainable action (such as recycling or drinking from a reusable bottle), take a picture and post it on social media. Winners will be entered in a drawing to win prizes. Weekly tabling messages - CfS will table weekly to promote RecycleMania and other upcoming events. Residence Hall Competition - During RecycleMania, we will be measuring the amount of recycling collected from each residence hall. The winning hall with the most recycling will receive a pizza and wings party hosted by CfS and RHA. Recycled Boat Regatta - On March 9th, CfS will host a recycled boat regatta race on Lake Ruby at 4PM (registration information and more details coming soon). 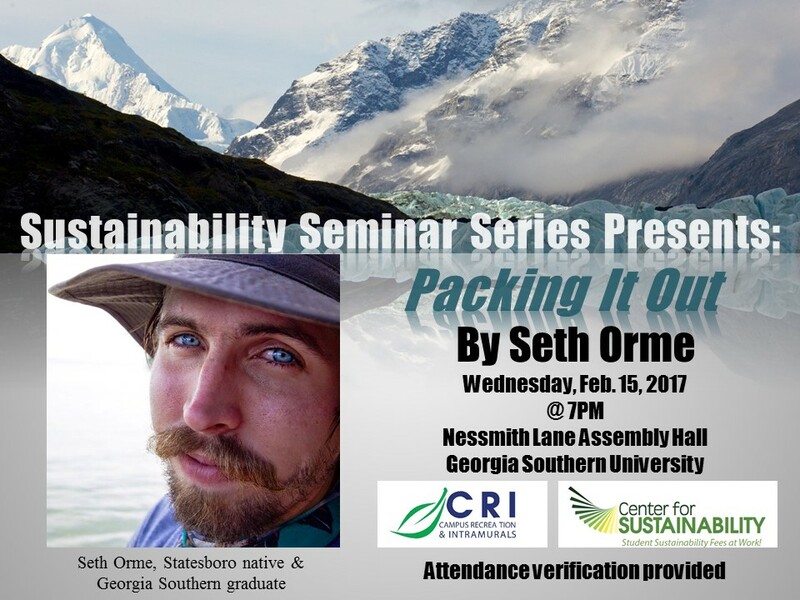 The Center for Sustainability will feature Statesboro native and Georgia Southern graduate Seth Orme as the first Spring 2017 Sustainability Speaker at Georgia Southern. Co-founder of the "Packing It Out" Project, Seth Orme will speak about his experiences raising awareness of Leave No Trace principles and packing out thousands of pounds of trash while thru-hiking the Appalachian and the Pacific Crest Trails. His public lecture for the campus and community will inspire the audience to #LeaveItBetter. 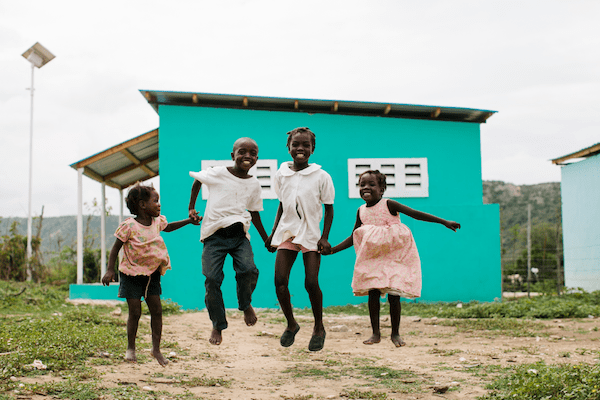 Matthew Marshall, co-founder of the non-profit start-up New Story, will speak about his experience as a young social entrepreneur and the company's work to transform slums into sustainable communities in Haiti, El Salvador and Bolivia. The event, part of the Global Engagement Series and the Sustainability Seminar Series, is free and open to the public. Your Student Sustainability Fees at Work! 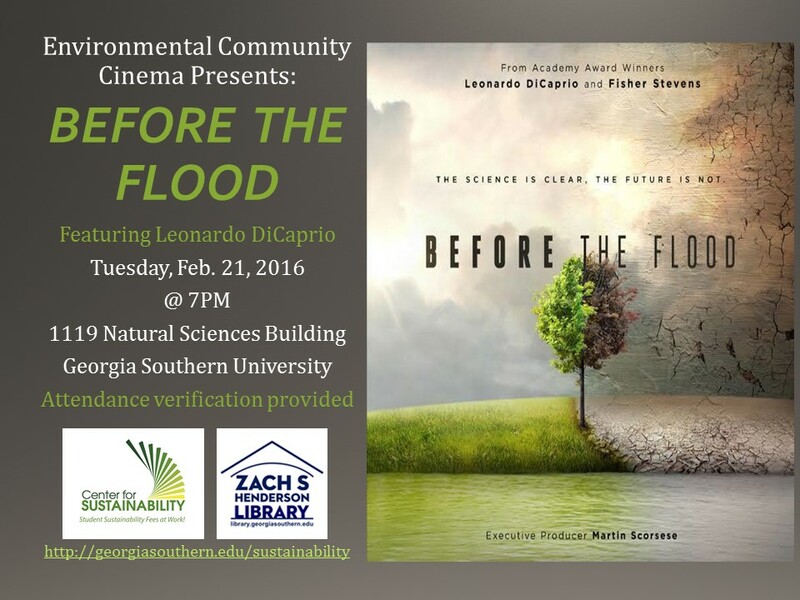 The Environmental Community Cinema presents Before the Flood featuring Leonardo DiCaprio. As a United Nations Messenger of Peace, DiCaprio travels to 5 continents and the Arctic to witness climate change firsthand. Before the Flood presents a riveting account of the dramatic changes now occurring around the world due to climate change, as well as the actions we as individuals and as a society can take to prevent the disruption of life on our planet. 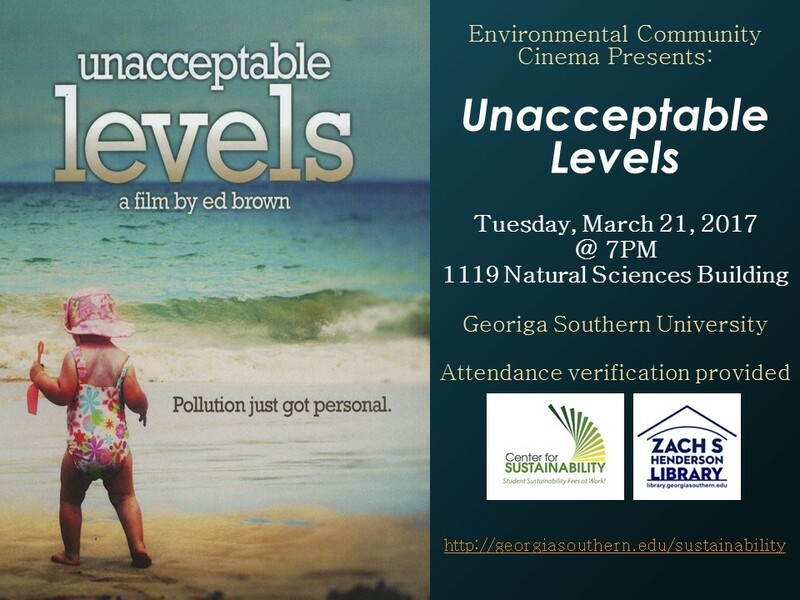 An award-winning documentary, Unacceptable Levels examines the unseen threat of toxic chemicals in our daily lives through the eyes of filmmaker Ed Brown, a father seeking to understand the world in which he and his wife are raising their children. Anchored in Brown's own poignant experiences, the film follows his quest to uncover the impact of toxins on his family's health. Come see several short films about our ocean life and the issues it is currently facing as well as listening to what experts have to say at this year's film festival. 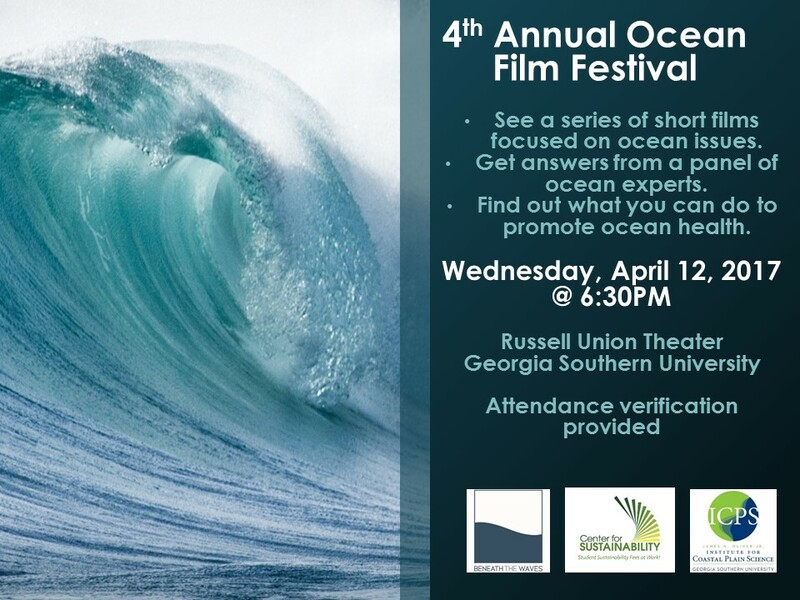 Hosted by the Institute for Coastal Plain Science in collaboration with the Center for Sustainability, the 4th Annual Ocean Film Festival will take place on Wednesday, April 12, 2017, 6:30-8:30 PM in the Russell Union Theater on the Georgia Southern University campus. Admission is absolutely free and all are welcome! Visit Beneath the Waves for more information. 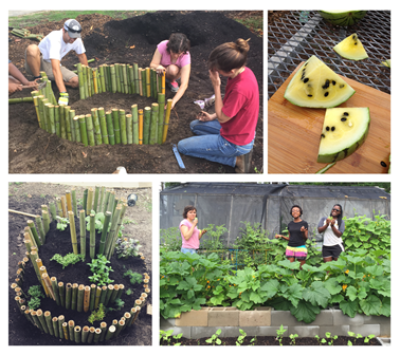 In Fall 2016, CfS guided over 20 student participants who successfully tended six garden plots at Georgia Southern's Campus Community Garden, located between Herty and the Williams Center. Participants attended bi-monthly workshops with topics that focused on composting, garden management, plant parts and more. With the help of CfS student intern, Cortney Johnson, the students grew varieties of kale, lettuce, carrots, arugula, beans, radishes, and an assortment of herbs. The Campus Community Garden gives students tangible benefits from their sustainability fees through healthy produce they can eat and skills they can use for the rest of their lives. We are looking three new student groups (must have 4+ members) to garden their own plots in Spring 2017.Contact Cami Sockow (csockow@georgiasouthern.edu) if you would like to participate. April 9-16: CfS and the University Wellness Program present the 6th annual No Impact Week - a week of campus sustainability awareness and activities. All campus units are encouraged to participate by hosting an event anytime or featuring a display any day at the Rotunda 11 am - 1 pm. Contact CfS to participate. Fall 2016 Afterschool Garden Teacher Cortney Johnson helping one of the elementary school students plant new things for the school garden. In Fall 2016, the Afterschool Garden Program continued to provide knowledge and practical skills to 1st-3rd grade students at five local elementary schools across Statesboro. Georgia Southern volunteers taught children different weekly topics including the plant life cycle, photosynthesis, plant parts, and friends and foes of the garden. In Spring 2017 we are introducing new lesson plans including composting, types of soil and seeds, spring versus fall planting, and more. Student volunteers will also be constructing new garden beds for one of the elementary schools. 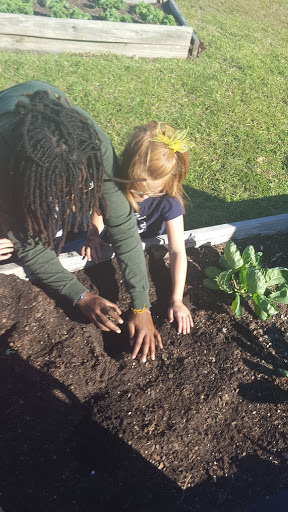 The afterschool garden program is a partnership between the Center for Sustainability, the Department of Health and Kinesiology, the Office of Leadership and Community Engagement, Bulloch County Parks and Recreation, the Board of Education, and Lee Family Farms. CfS worked successfully with Housing to place recycling bins in every suite in all eight residence halls on campus in Fall 2016. Since that time, participating students have won prizes for filling up their recycling card (10 punches wins a prize) and have diverted more than 2,500 gallons of recycling from the landfill. Nice work! This effective program would not have been possible without the support of the resident directors, community leaders and supportive staff in Housing. We look forward to increasing our diversion rate in Spring 2017! 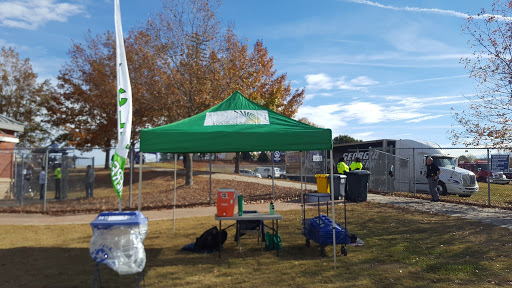 The CfS Recycling Station, set up in the tailgate lot for all home football games. Fall 2016 football season for the Eagles was True Blue and Green Too with improvements to the Tailgate Recycling Program. CfS continued to collaborate with the Division of Facilities Services and Athletics to increase the diversion rate of aluminum cans from the landfill for the six home games this fall. October 1, 2016 welcomed the 4th Annual GreenFest, a free sustainability festival for all ages held on the courthouse lawn in downtown Statesboro. A record crowd of more than 1,500 university and community members enjoyed live music and make-and-take activities, and learned about sustainable solutions and products from more than 40 vendors. Participants viewed the creative entries for the 2nd Annual Pallet Challenge and got to cast their votes for the People's Choice winner. More than 100 volunteers dedicated their time to making the event a success including an Alumni Day of Service litter clean up to beautify Statesboro. CfS provided a shuttle service form campus for the event, and the whole downtown was involved with green stop shopping and the always-fabulous Main Street Farmers Market. President Hebert and CEO of Sea Island Bank, Darron Burnette, concluded the day of green fun with remarks about the importance of sustainability to both town and gown. For more information, visit the Center for Sustainability.